This mod was done to access the rear most fasteners on the Edelbrock TES, and also aid in the R/R of the sparkplugs. 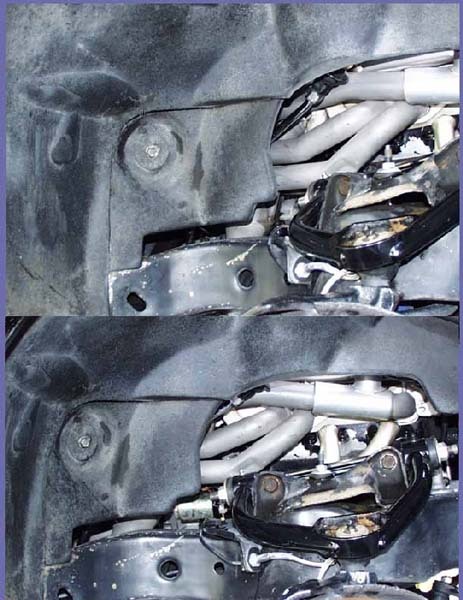 With the right front tire removed, looking at the inner fender, you will see a crease at about the same level as the top of the radiused opening (where you can access the spark plugs). I took my dremel tool with a cut off wheel and followed this crease horizontally to the rear of the car. 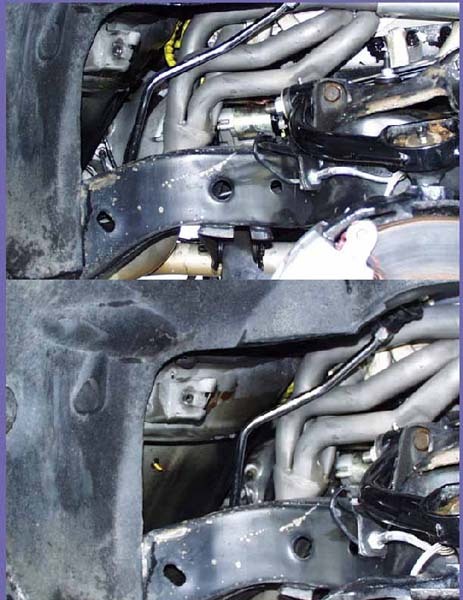 There is a bolt with a large washer used to mount the inner fender to the fire wall. Follow around the outside of the mounting boss for the bolt, and drop down vertically until the section drops out. What you have now is a nice access door that you can remove and replace easily with a 1/2" socket. Don't forget to deburr the inner fender and the piece that you just cut off before you start working. There can be some sharp edges that you can cut yourself on. Now you have access to that darn fastener in the rear, as well as more room to get to the others!... ;-) With the piece bolted back into place, you can hardly even tell that any mods were done. Here's a couple of pix taken at different angles to show the effectiveness of the modification when the door is removed. Now there's plenty of room to get to those darn TES fasteners. As you can see in these pix, the TES that are shown are the original ones that had the Hi-Tech coating burned off of them when I broke in the 383.